A desire to start doing some more serious video work has slowly grown stronger. Finally I took the plunge and bought one of the best video capable interchangeable lens cameras, the Panasonic GH2. This camera uses the same m43 system as my Olympus E-P2 camera, meaning that all the lenses can be used on both cameras. I ordered the kit with the 14-42 lens, which actually was only marginally more expensive than just the camera body, to a local shop, Kamera-Aitta. It was a little more expensive than it would have been from a German internet store, but I am willing to pay a little more to get it locally. Parallell to this I streamlined my existing system a little, due to some ridiculous rebates at another local camera store, Rajala Pro Shop. I sold some existing lenses and the Olympus E-P2 body, since I can't afford and don't want to have stuff I don't use. The E-PL1 is a cheaper version of the E-P2, which I sold. It has fewer controls, a slightly less advanced image stabilizer and a fastest shutter speed of 1/2000s. The image quality should theoretically be slightly better: It has the same sensor, but a weaker AA-filter that should help resolving a little more detail. I doubt I will be able to notice any difference, though. Somewhat surprisingly, the E-PL1 does have a small internal flash that can be used to trigger external Olympus flashes, giving full wireless TTL control over several external flashes. I tried it and it really does work. This camera should be a good second camera body to have. I had contemplated the Panasonic GH2 for some time, but wanted to see how the new Olympus m43 flagship, the OM-D E-M5, would turn out. The E-M5 is a very interesting camera, with most features better or at least equally good as those of the GH2. According to the first reports, the E-M5 has an exceptionally good image stabilizer that works wonders for videos as well. Unfortunately, the video capabilities of th E-M5 are otherwise no match for the GH2, so I ultimately decided to get the GH2. It has the best sensor of the current m43 cameras (the performance of the E-M5 sensor is still undetermined) and is especially good for videos. The GH2 offers a lot of functionality and it will take some time to learn it to get the most out of it. There is even a bunch of hacks for the GH2, which improve the video quality quite a bit. I tested out a simple and well supported version to get a higher bitrate, which translates to more details when a lot happens in the picture, and high ISO in manual video mode. ISO 8000 did seem quite usable for video, at least when using the maximum noise reduction setting. A lot to learn and test out. These two cameras and the lenses all follow the m43 standard, and hence all the lenses are compatible with both cameras. 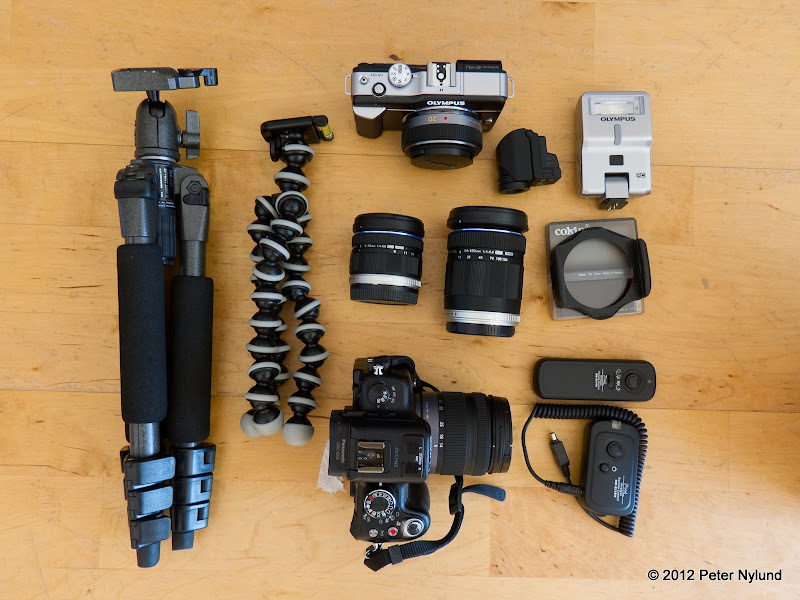 I will probably not bring the entire system at the same time, unless explicitly doing a photography excursion. In addition to the cameras above, I still have the Canon S90 pocket camera. It gives good image quality in a truly pocketable format and has a bright lens with a maximum aperture of 2.0, so it is quite usable when the sun isn't shining as well. I also have the CHDK software for the S90 and intend to use it for some time-lapse photography. It seems like the Cokin filters are no longer popular. Not a single camera shop in Turku had them. I do have some left from the old pre-digital days, but need some more. The local shops just suggested the ordinary screw-on filters and did not even have step-up rings. With three different filter sizes and two different strength ND filters I would need six of the screw-on filters. Not acceptable. Yeah, I got mine from Amazon. To be honest, they're not great quality, but Cokin do a pro range now too. You are right that they are fairly cheap bits of plastic. I actually ordered two 58 mm ND filters of different density, along with a few stepup rings, to my local camera shop today. They should be better.